Rice vermicelli noodles, also known as "sen mee" in Thai, are delicious and easy to prepare, made by Wai Wai which is the premium manufacturer in Thailand. These are a unique kind of noodle for particular use in the recipe Mee Krob. When making mee krob, put these noodles into hot oil and they instantly quadruple in size as if to pop like popcorn. Otherwise, simply cook (or soak) in warm water for just two minutes, and they make a really healthy, hearty meal stir-fried or in soup. Add sliced meat and vegetables if you prefer. The noodles are very thin, a bit like angel hair pasta, so this is quite a lot different than chantaboon rice stick noodles which are wider and thicker. 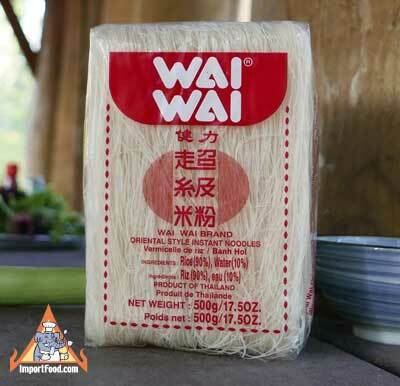 We also offer Wai Wai instant noodles: Classic Oriental, and Tom Yum flavors. Martha Stewart recommended ImportFood.com for rice vermicelli. Ingredients: rice, water. Product of Thailand.